The Franconia Conference board welcomed Gwen Groff as a new board member at their May 11 meeting. 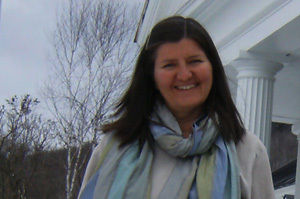 Gwen has served as pastor of Bethany Mennonite Church in Bridgewater Corners, Vermont since 1999. During that time, she has been very active in the conference, in spite of the distance. 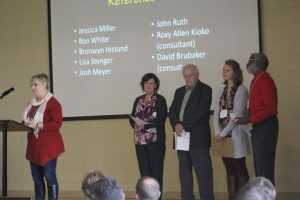 She has served as a Franconia Conference delegate or congregational delegate at Mennonite Church USA (MCUSA) conventions and has attended most Franconia Conference assemblies. Gwen’s encouragement also prompted Franconia Conference to start recording pastors and leaders events, so that those who could not attend would still be able to access that resource. Gwen grew up in Lancaster County, Pennsylvania and completed her undergraduate work at Eastern Mennonite College and Franklin & Marshall College. She later received a master’s degree in Theology and Pastoral Counseling from Lancaster Theological Seminary. While in seminary, Gwen interned with and then served part-time at Community Mennonite Church in Lancaster. 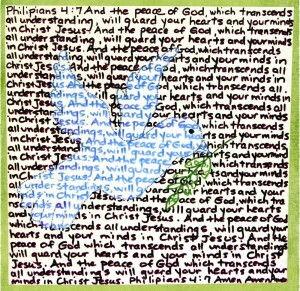 Prior to pastoral ministry, Gwen held several roles with Mennonite Central Committee (MCC), including working in peace education in the Akron, Pennsylvania office, and at the London Mennonite Center in the United Kingdom. She also served as MCC’s director of women’s concerns. While in London, Gwen met her husband, Robert Buchan. They have two children, Lilly, 18, and Andrew, 16. She also loves the people in her congregation, and how they do things with integrity and a lot of intention. Says Gwen, “You don’t accidentally wind up in a Mennonite Church in Vermont. The church had to planted.” (Bethany is one of only two MCUSA churches in Vermont.) 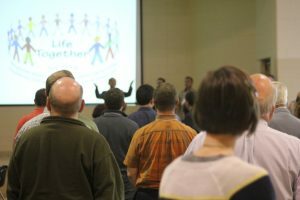 What seems to draw Vermonters to Bethany and the Mennonite tradition is the peace witness, the opportunity to sing together, and the community, as the congregation is active in one another’s lives throughout the week. At Bethany we share communion at least three times each year. 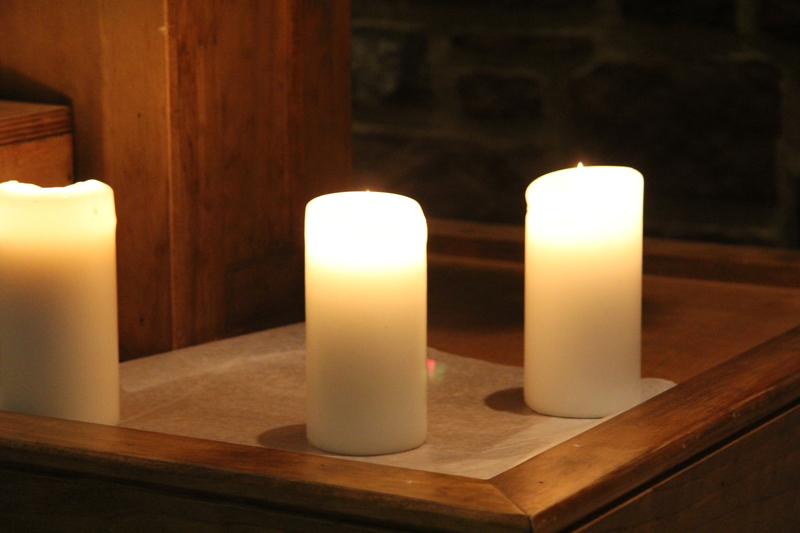 Our first communion service is in January when we renew our annual membership covenant with each other. Our system of membership at Bethany is an odd hybrid. We can become members by taking a membership class and being baptized or by transferring a letter of membership from another congregation, and we can become members by annually affirming our covenant with this congregation. When we renew our membership covenant each January, affirming that we intend to walk with this particular group of people and uphold our commitments to what we state in our covenant, we mark this by celebrating communion together. By comparison, our communion services at Bethany feel very open, perhaps even lax. I invite people to come forward to receive the bread and cup with the words, “This is the Lord’s table and all are welcome.” I do not ask if someone has been baptized or is a church member. This seems not very Anabaptist. It does however seem to be in keeping with what Jesus did in sharing the table with anyone who wanted to eat with him. The Bethany communion service that I most enjoy is part of our annual outdoor service. Each summer I mow a labyrinth into the grass in the back lawn and at our outdoor service we take the bread and cup just before we begin walking the the labyrinth together. We walk into the middle of the labyrinth in silence, pause in the center circle, and come back out again. Some people look into the faces of others they pass going the opposite direction, some look down, some are chewing the bread, many are barefoot. Some children are held in their parents’ arms. Most of the children enter the labyrinth at the front of the line and run to the center ahead of the adults. There they receive a spoken blessing from one of the servers, “You are known and loved by God,” and are given grapes and crackers. They run or walk back out, passing the adults who are still on their way in. The adults walk more slowly and contemplatively. I usually take the bread and cup to the older people who are unable to walk the labyrinth and are seated on the grass that is slightly higher than the labyrinth. I love to look out across the people walking and see our congregation moving as one, like a giant organism on the grass. Sometimes we are a little crowded as we walk but we have not outgrown the practical limits of this ritual. The service is full of laughter and reflection, movement and epiphanies. If the labyrinth symbolizes our spiritual path, the bread and cup represent nourishment for the journey. Our other communion celebration is part of our Good Friday service. This communion meal seems to be most in the spirit of the first Last Supper. It holds together the joy of the Passover celebration, remembering liberation from slavery, with the grief of the looming death of Jesus. It focuses on the stated purpose of communion — doing this in remembrance of Jesus — reminding us of his life, death and resurrection. The service is virtually the same every year. We eat a simple meal together in the church basement on Good Friday evening. We read aloud the Passion account from one of the gospels, we sing, we serve one another the bread and cup, and we leave in silence. I value something about each of these three services. In the January communion service, I appreciate the emphasis on our covenanted commitment to God and one another. I appreciate the symbolism of nourishment for our faith journeys that is part of the summer communion service. And I appreciate the remembrance of the first Lord’s supper that is part of our Good Friday service. What I love about all of them is the way the communion ritual holds in tension joy and sadness. Words can’t make sense of that paradox, “proclaiming the Lord’s death.” But ritual does. 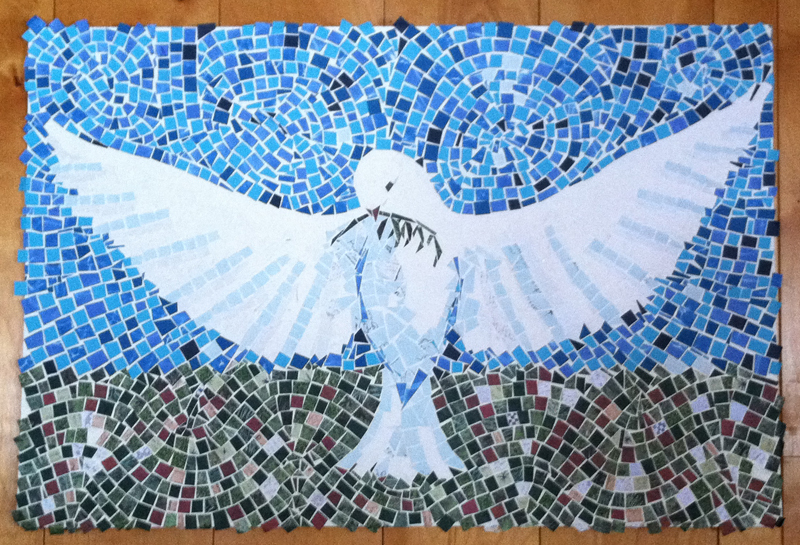 This mosaic hangs at the front of Bethany’s auditorium and is made from slips of paper that members wrote on as part of one Sunday’s sermon. Bethany is an intimate ecumenical gathering in Bridgewater Corners, Vermont. We began as a small group of five families who followed a call to move here from PA in the early 1950’s. We are currently led by Gwen Groff. We foster a healthy awareness of the broader Christian faith as it relates to our global community. We are excited about Jesus Christ. We celebrate the transcendence of his birth. We marvel at the complex grace of his time on Earth. We rejoice in the solemn beauty of his death and resurrection. We are excited about continuing His story of a deep love for the women and men around him, as we live and work here in a quiet corner of the world being the hands, feet, body and blood of the Word-made-Flesh. We come from all walks of life. We come from all political persuasions. We come from all economic backgrounds. Our common theme is our deep love of the way of Jesus. We love to sing together. We love to eat together. We love to camp together. Our children are important to us. That they have a safe place to seek out their Creator is tantamount to our existence as a body of faith. In light of all of this, we see ourselves as good soil- no more and no less. Good things grow here. The theme for our Summer Bible School was “Be Bold! God is with You!” The children learned through songs, dramas, stories, crafts, and games, that God is with them, even when they are scared. A piece of SBS that caused a lot of excitement among the children was an offering project competition between the girls and the boys. The children were raising money for a Mennonite Mission Network project, which sends children in South Africa to Bethany Bible School, a camp that teaches the children about Jesus. It costs $20 to send one child to the camp, and the boys and girls at SBS were competing against each other to send the most children to camp. If the boys won, then the Children’s Ministry Director (me) would get a pie in her face, and if the girl’s won, then the Lead Pastor would get the pie in his face. The children took this competition seriously and were bringing in their piggy banks, doing extra chores to raise money, and asking grandparents to write out checks. By the end of the week, the 70 children at SBS collectively raised $1,162.53, sending 58 children to Bethany Bible School! Although the boys won, and I got a pie in the face, it was decided that the real winners were the 58 children that would now be able to attend the Bible Camp. Thanks, Kim, and everyone else who shared their photos and stories this summer! 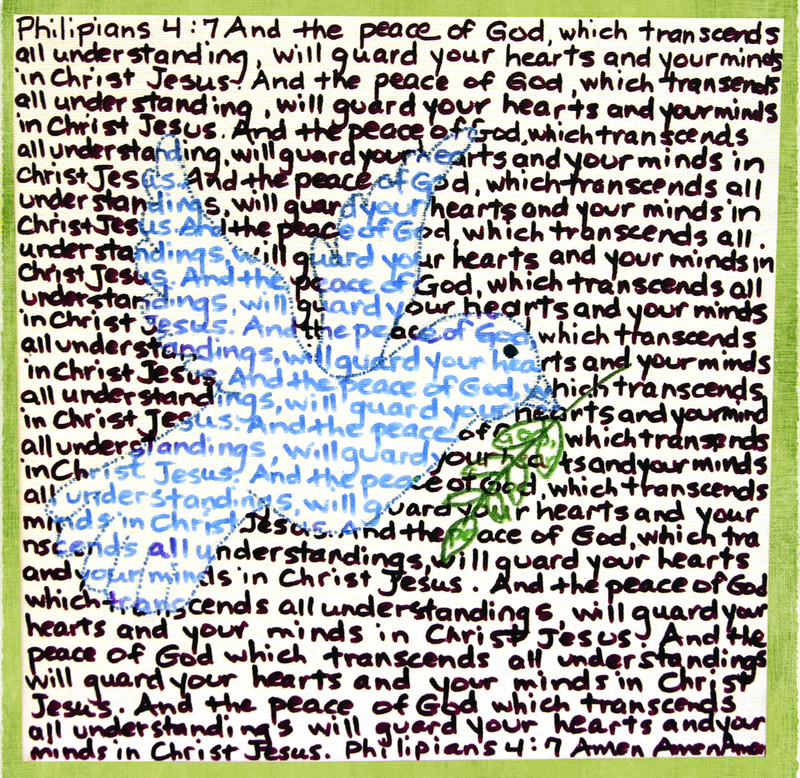 And if you haven’t already read them, check out these stories about Peace Camps, Bethany’s anniversary celebration, a special service at Plains, Salford’s listening project, Kingdom Builders construction in Philly, Germantown Historic Trust’s painting project … and this is just some of what has been happening in our Conference this summer. Enjoy these fun photos that were taken at camps, picnics, outdoor services, Bible Schools, and more. If you’d like to add photos from your congregation’s summer to this gallery, send them to Emily with captions and photo credits. On August 12, Bethany Mennonite Church in Bridgewater, Vermont, celebrated their 60th anniversary. As part of their celebration, people from the church, community, and the conference shared their memories from the last sixty years. The following article is adapted from those stories. 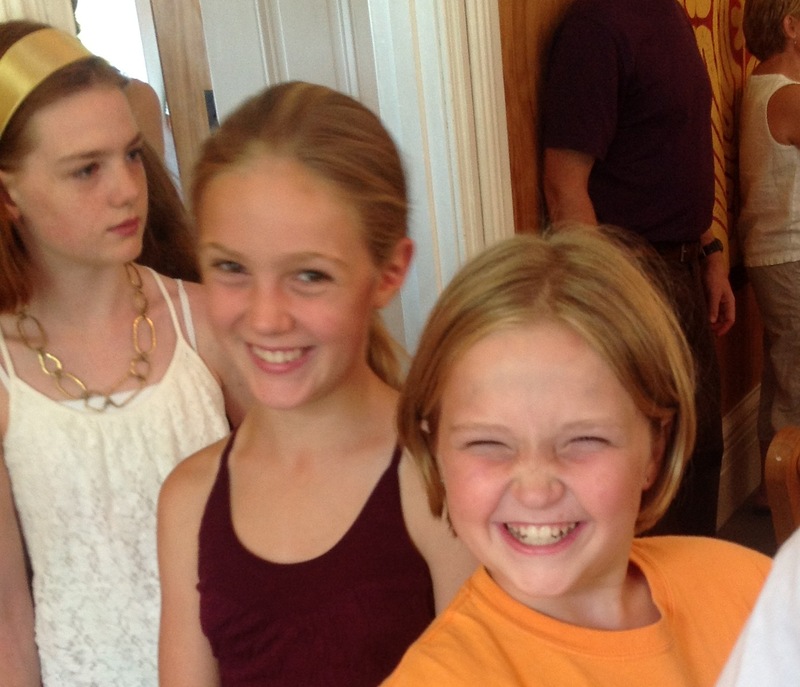 Izzy Jenne, Anna Hepler, Annabel Hershey Lapp enjoying themselves at Bethany’s 60th anniversary celebration. Photo by Karen Hawkes. Sixty years ago, it became a congregation. Three of the four families that came from Franconia Conference to start the mission church gathered for “The Picture.” We all looked so excited and full of energy. This is the look that people get when they don’t have a clue what the future will bring. I remember some things from those early years, the 50s: sliding down the old stair railing (adults didn’t seem to realize God meant it to be part of the children’s playground); multigenerational church socials in the damp and dark church basement; sitting in the hay wagons every fall eating crisp Macs on hayrides through those dark back roads of Vermont. I learned to keep an eye out for the tree branches that might sweep down and get you. I remember growing up in two worlds, the church world and the Vermont secular world. They seemed very different. We all kind of learned the hard way, as individuals, families, and a congregation, that transplanting ethnic Mennonites into a “foreign culture” was probably not the best way to plant a church. Hard lessons were learned, maybe too hard sometimes. I saw my parents having to learn and relearn and still remain faithful to their call. I remember once when we had a “breaking of bread service.” It wasn’t a regular communion service. Each person was given a small bread roll, and we went around and broke off a piece of our roll and gave it to someone else until our roll was gone. That service felt like a great big pair of arms was holding the whole congregation in a big hug. 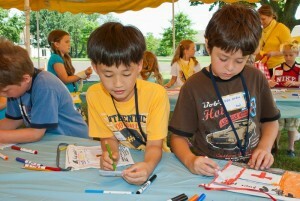 Summer Vacation Bible School was a BIG, two-week affair. I went door to door asking if families would like to send their children and we drove them every day in a vehicle owned by the church and then the town school bus. When we grew to over a hundred children, teachers came from the other churches in Bridgewater and from the community as well as Bethany. Bethany worked closely with the other churches in the area, especially with the Congregational Church in Bridgewater. When [Pastor] Nevin had a brain aneurysm, the Bridgewater church was very supportive of this congregation in many ways. They held a fund raiser for Nevin by having a community potluck meal that brought many, many people together. I saw God’s face in the early morning walks and talks through many back roads with other women through the years. We would gather at the church with our flashlights before our day of work began. We valued friendship, faith, and health. I saw God’s presence in families from the village who brought their young children to the parsonage for childcare. Conversations relevant to life happened at daily drop-off and pick-up times. I felt joy watching my children play among many others in the field in a safe, open environment. The first thing that struck me when I came to Bethany for the first time was the beautiful singing with everyone doing harmony and no choir. We were all the choir! What if a group of church leaders from Franconia Conference in the middle of the 20th century hadn’t decided there was a need to start a church in Vermont called Bethany Mennonite…? It’s a familiar story, especially for those who have grown up in the church. So how do we retell the story of Jesus’ passion and resurrection year after year in ways that open us up, once again, to the pain, the beauty, and the wonder of Jesus’ sacrifice and victory over death? 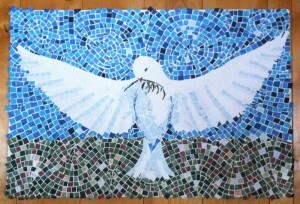 Members at Souderton congregation contributed artwork made of scripture. Photo provided. The season of Lent, celebrated for the forty days leading up to Easter, marks Christ’s journey to Jerusalem. It invites those who follow Jesus to walk with him by remembering his life, practicing disciplines of fasting and sacrifice, and engaging in deeper commitment to their brothers and sisters in the church. Souderton (Pa.) congregation began Lent by diving deeper into Mennonite Church USA’s “Year of the Bible” with an art project. 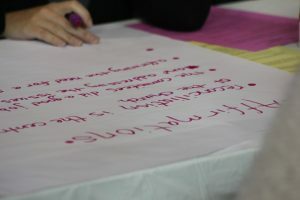 Members of the congregation were invited to choose a word or phrase from scripture on which they wanted to meditate and to write it over and over on a panel using colors to create images. These panels became banners that hung in the front of their sanctuary during the Lenten season. Souderton wasn’t the only congregation to celebrate the imaginative Spirit. Swamp (Quakertown, Pa.) spent Lent exploring God as creator, “littering” the steps of their platform with items created by members of the congregation, symbols of God’s unique creative work in them. 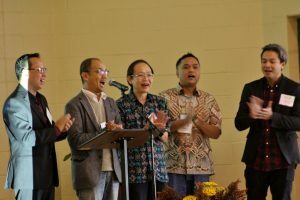 Their children memorized Psalm 139, which they recited on Palm Sunday after leading the entire congregation in a procession, joyfully waving palm branches. 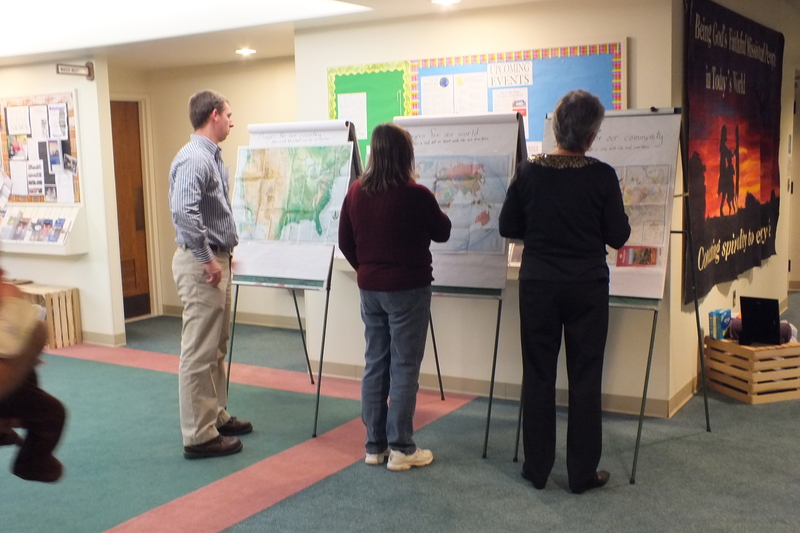 Plains congregation used maps to illustrate their prayers for their region, country, and world. Photo by Dawn Ranck. Palm Sunday marked the beginning of Holy Week and was the day when Jesus entered Jerusalem to the adoration of the crowds. The week soon turned more somber, however, as Jesus ate his final meal with his disciples, washing their feet, and predicting his betrayal. These events are remembered on Maundy Thursday. Conference congregations reenacted Christ’s humility with their own experiences of footwashing. Traditionally, Mennonites have practiced footwashing in groups divided by gender. At Perkiomenville (Pa.) congregation this year, footwashing was one of several stations that members could visit, which, for the first time, allowed married couples or family members to wash each other’s feet. 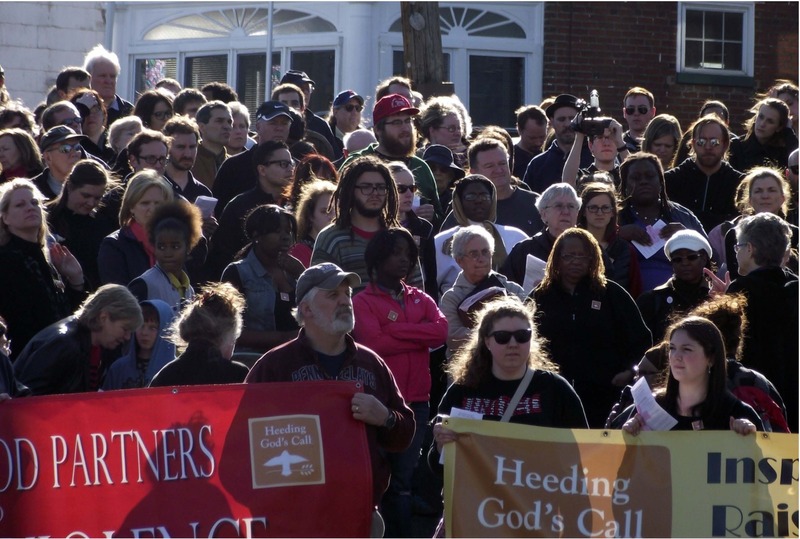 Franconia Conference members joined Christians from all over the Philadelphia region for a Good Friday vigil outside a gun shop. Photo by Jim McIntire. 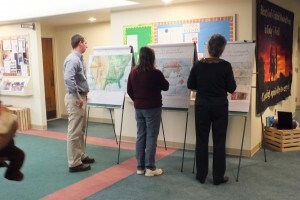 In addition to footwashing, Plains (Hatfield, Pa.) congregation acted out Christ’s care and humility by setting up prayer stations with large maps of the world, the country, and their region. Members could pray for and mark areas on each map with a dot or a heart. Compassion for the community continued to spread into Good Friday, the day when followers of Jesus remember his death on the cross. Members of churches all over the Philadelphia region gathered outside a gun shop in the city for a Good Friday vigil. 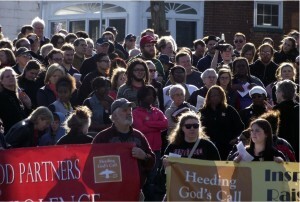 As these believers stood against violence in the city, others gathered in Good Friday services to remember that Jesus’ death made peace and reconciliation with God, and one another, possible. Just when Good Friday seemed like it couldn’t get any darker, Salford (Harleysville, Pa.) congregation’s evening service was suddenly interrupted by a power outage. For just a few, brief moments the congregation was surprised by the darkness and powerless to do anything but sit in the shadow of the cross. There was a hush in Franconia Conference on the Saturday of Holy Week, as though the Church was holding its breath, waiting for the joy they knew was coming on Easter morning. And the joy did come—in colors and flowers, in song and story, in food and hope and promise. Crosses were draped in white and lilies and hyacinths and forsythia decorated sanctuaries. Congregations met as the sun rose, around breakfast tables, and in their morning services to celebrate an empty tomb. Philadelphia Praise Center viewed a video in which church members took to the city streets to ask people about the significance of Easter. Blooming Glen (Pa.) congregation acted out the resurrection story in a chilly sunrise service and a member at Deep Run East (Perkasie, Pa.) built a custom tomb to display on Easter morning. In Vermont, members of Bethany congregation participated in an ecumenical sunrise service on the side of Mt Killington and then, after brunch, were led in worship by a new generation of storytellers–their children. It’s a familiar story, and yet it’s born fresh each year as we once again walk with Jesus through Lent, Holy Week, and the Easter season. In this story, we recognize what theologian H.S. Bender once wrote: we live on the resurrection side of the cross. May we continue to celebrate Christ’s resurrection by living our lives as a resurrected people. He is risen: He is risen indeed! 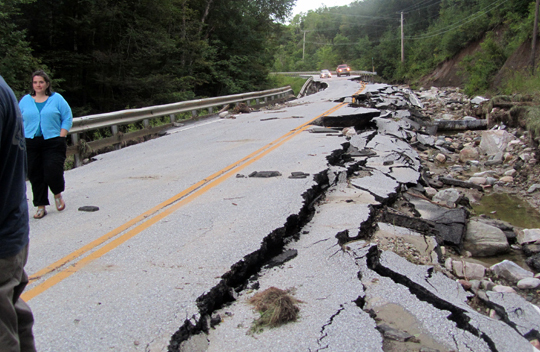 Route 100 in Plymouth, Vermont after Tropical Storm Irene tore through the region. Photo by Brandon Bergey. Although I’m not much of a pusher, I can sometimes identify with the desire to see movement for which I’m not responsible. But the community response to Tropical Storm Irene, which hit Vermont on Sunday, August 28, 2011, was a moving train I was not pushing. Instead I felt I was running to catch up with what was already on the move. I was out of town when the storm hit. My husband Robert and I were at the beach in Maine celebrating our 20th anniversary when Irene poured eight inches of rain on our town and washed away roads, bridges, power lines, homes and land. In Maine the seas were high but we saw little rain or storm damage. We were oblivious to Irene’s impact until we happened to meet some other Vermonters on the beach who told us that our governor had declared a state of emergency. We started paying attention to the news and trying to phone home. We couldn’t reach the friends who were keeping our kids but our neighbors told us not to bother trying to come home early. The roads to our house were closed and the road between us and our children was washed away. When we got home on Tuesday, we started seeing the damage in our neighborhood and hearing the extent of the damage in our small state. Five people drowned, 1400 were driven from their homes. Two hundred bridges were damaged and 530 miles of roads shut down. With power still out and roads around us yet closed, we had little to do but walk around to our neighbors and see what needed to be done. Some people immediately got busy coordinating relief supplies and equipment. We were asked if we could use the church vestibule as a distribution point, but it soon became clear we’d need a bigger space, and the Grange (town) hall next door became the local hub of activity. I was slow to catch up with what my role should be in this situation. I mostly listened a lot as people shared their stories. When electricity was restored I baked bread and took it to neighbors who had been evacuated and people who were cleaning mud out of their basements. Many were sorting and drying out their possessions. Several people suggested Bethany have a special service. Vermont is a notoriously secular state, and only one other time—after 9/11—did people in this community ask for a worship service. But the week after Irene several people said they would like time to come together and pray. One person from the community suggested that we have a Eucharist but use water instead of the usual elements. Water is what caused us so much trauma. But water is also what we most needed, clean water to drink, water to wash our hands and shower and flush, water to cleanse the contaminated soil. So we gathered and sang and prayed and had a water ritual. I had planned several readings and songs to follow the ritual, but sharing the water was the start of people sharing stories, and that went on for more than an hour. People didn’t want to leave. People became more expressive of their compassion. Neighbors who normally barely waved at each other had conversations and came into each other’s houses and helped sort through one another’s chaos. Neighbors in isolated pockets shared meals and water, sump pumps and generators. In this community of independent, self-sufficient Vermonters, people gave and accepted help. For some, fear lingers. The sound of water brings anxiety. And many people are exhausted by the process of haggling with insurance companies and FEMA. But the community has become more kind and connected, and there is no turning around that train. Flood waters due to Tropical Storm Irene were subsiding by Sept. 6, but extensive devastation remained as cleanup and repairs began for Mennonites across Vermont, including some who were isolated for days. The storm weakened as it made its way along the Atlantic sea­board the last weekend of August but dropped several inches of rain in just a few hours in many places. In Vermont, raging rivers washed out hundreds of roads and damaged dozens of bridges. More than a dozen Vermont towns, including Plymouth, home to the Mennonite-affiliated Bethany Birches Camp, became virtual islands. Good and Gwen Groff, pastor of Bethany Mennonite Church, accounted for all of their members, though some evacuated their homes. Both meetinghouses as well as Bethany Birches Camp sustained little damage. 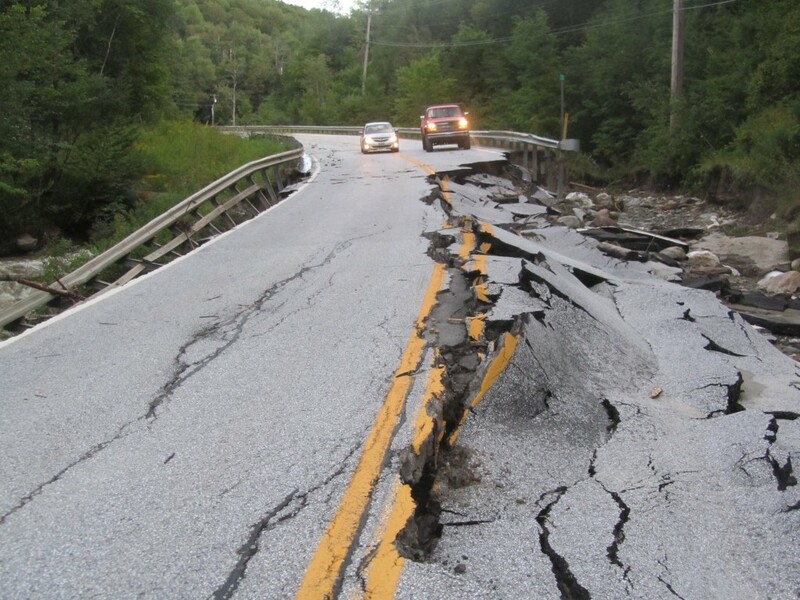 More than 60 percent of the 450 miles of Vermont state roads that were closed have reopened, The Wall Street Journal reported Sept. 5. Still, some roads remained closed. According to Google Crisis Response, parts of the main road that runs between the camp and the Bethany congregation were only open to authorized vehicles. 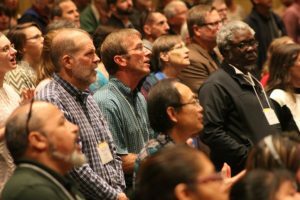 “Franconia Conference communities in?Vermont seem to be at the center of some of the most extensive damage,” said Stephen Kriss, director of communication for Franconia Mennonite Conference. On Aug. 30, National Guard helicopters airlifted food, water and supplies to isolated towns, including Plymouth.The storm killed three people in Vermont and at least 55 total. Preliminary estimates put total losses along the East Coast at about $7 billion. Brandon Bergey, executive director of Bethany Birches Camp, was using his motorcycle to get around. He said most towns were setting up relief stations where people could get gas, food and water. The local community, Bergey said, is drawing closer together. “In a rural area like ours, it’s not always easy to connect with neighbors; now it’s easier,” he said. Groff, pastor of the Bethany congregation, lives with her family in a parsonage next to the church. Though it sits along the Ottauquechee River, which overflowed its banks, the Groffs’ home received minimal damage. Route 4, the main road between the Bethany and Taftsville congregations, will be closed for months, Good said. “Some roadways that seemed passable have been found to have caves washed out underneath the roadway, and some have collapsed,” he said. Six people from Franconia Conference congregations volunteered with MDS in Vermont Sept. 5-8. They removed debris and sorted through damaged buildings. 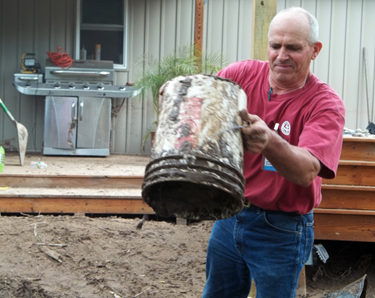 “The primary effort right now is simply getting wet materials out of homes,” said volunteer Ted Houser of Lancaster, Pa.
Houser noted the timeliness of their service: Mennonites worked on storm cleanup on Labor Day in Vermont, Pennsylvania and New York. In other storm damage, the basement of New Beginnings Community Church of Bristol, Pa., a Franconia Conference congregation, flooded due to the recent storm. Ertell Whigham, executive minister of Franconia Conference, said the church lost all of its educational resources, including computers. Originally posted in Mennonite Weekly Review, September 1, 2011 and updated on September 6. Reposted by permission.